I found one of the most charming gifts I’ve ever seen for the Disney fan – literally. Pandora and Disney have partnered together to offer unique, beautiful charms for bracelets and necklaces available at Pandora stores and at the Disney parks. 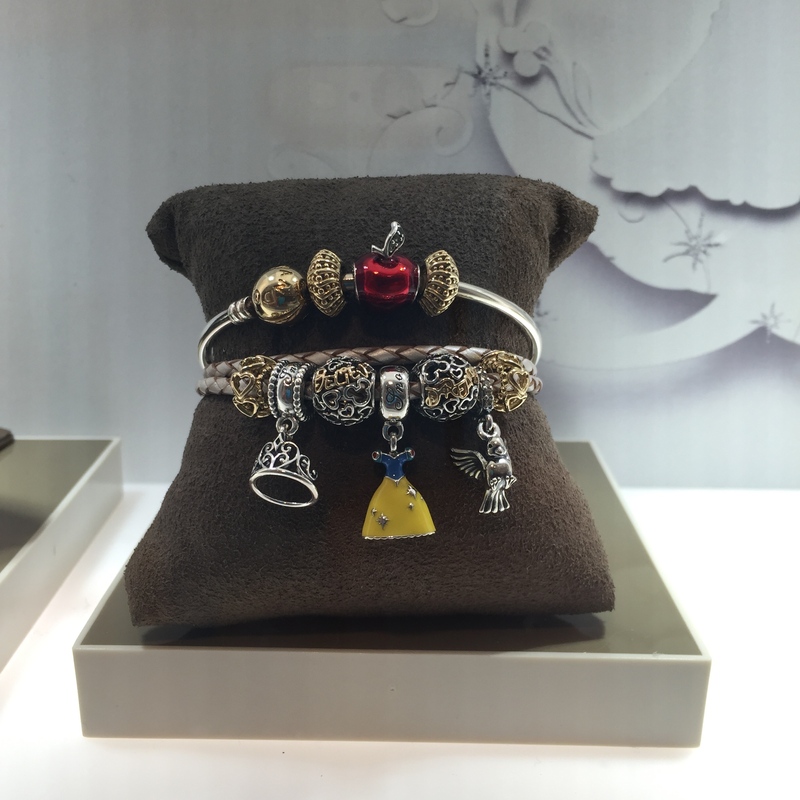 Pandora, a leader in the charm industry, is also creating special charms that can ONLY be obtained at the Disney parks and are not available anywhere else. 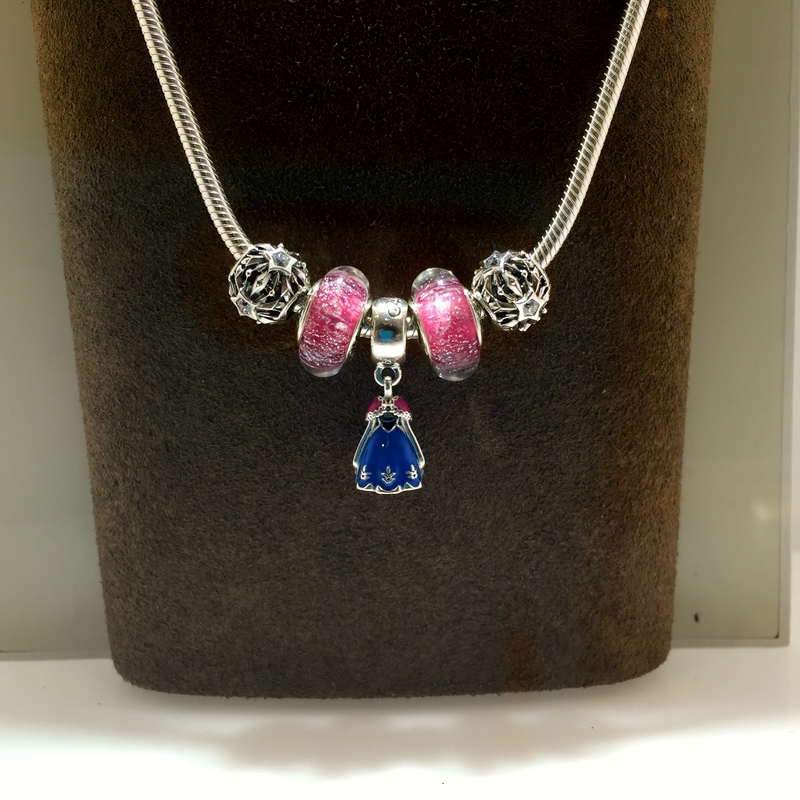 The interesting thing about Pandora charms is that they do get retired making them highly collectible and also great souvenirs for the jewelry lover in your life. These charms are not cheap, but they are also not priced so high that they are out of reach. But be aware that pricing is a la carte – meaning that each and every piece you see on a bracelet or necklace has to be purchased individually – including the bracelet or necklace. If you buy a bracelet from Pandora they come in different styles and compositions from fabric at $35 to 14K gold at $1415. There are leather bracelets which are sturdy and still reasonably priced at $45-50 but the most common one I noticed was the $65 sterling silver bracelet. The bracelet is important because it is the foundation of your charm collection. Necklaces can also be bought directly from Pandora either at one of their stores or online for a wide range of prices. The charms themselves though are the real draw. Each one ranges in price from the “Let It Go” $35 charm to the $90 Cinderella pumpkin coach charm. Most are in the $45-50 range each. Each princess featured in the collection not only has a dress charm but also a signature color charm, a crown, and other intricate pieces like the apple from Snow White, the slipper from Cinderella, and a shell for Ariel. The bulk of the collection features very beautiful pieces for Mickey and Minnie. If you’re looking for that special souvenir from the parks or for the Disney fan in your life, this collaboration between Disney and Pandora could be a charming solution to your search!